Sleep disturbances are very common in patients with heart disease and may be disturbed for pathological reasons (e.g., sleep disordered breathing) or the result of poor sleep hygiene. Sleep disordered breathing occurs in 50-75% of patients with HF and as such all patients with moderate to severe HF should be screened for the likely presence of sleep disturbance. See Sleep disturbance screening. The term sleep disordered breathing refers to conditions in which apnoeas or hypopnoeas occur during sleep. This includes obstructive sleep apnoea (OSA) and central sleep apnoea (CSA), which commonly coexist in patients with HF. 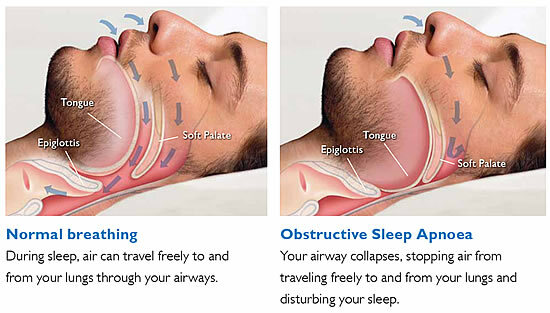 OSA occurs where upper airway obstruction (partial or complete) blocks airflow during sleep (see images below). This is usually due to low muscle tone causing relaxation of the muscles around the tongue and throat, excessive tissue in the upper airway, or anatomical abnormalities. OSA is more common in those with obesity, increased age, hypertension, and atrial fibrillation. Untreated OSA is associated with significant physiological sequelae. Overnight hypoxaemia and large intra-thoracic pressure swings lead to increased sympathetic activity, systemic hypertension, endothelial dysfunction, oxidative stress, tissue ischaemia, as well as platelet activation and increased coaguability. Ventricular ectopics, brady-arrhythmias and decreased heart rate (HR) variability may also occur. OSA is closely associated with atrial fibrillation (AF). CSA has a neurological basis in which the effort to breathe is either diminished or absent. In patients with HF, CSA most commonly occurs in the form of Cheyne Stokes respiration, an oscillatory pattern represented by alternating periods of increasing and decreasing breaths, separated by apnoeas. During the apnoeas, the central drive to breathe is lessened and is therefore associated with no respiratory effort. CSA is thought to be a sign of advanced heart failure and is a poor prognostic indicator for these patients. It is typified by sleep disruption, recurrent awakenings and gasping arousals. Common symptoms include fatigue, insomnia, nocturia and shortness of breath which may be difficult to differentiate from the HF itself. Conversely, patients may experience no overt symptoms and may not necessarily feel sleepy. [#arzt-m-bradley-td.-2006] As with OSA, the pathophysiological consequences of CSA include sympathetic nervous system activation, oxidative stress, endothelial dysfunction and systemic inflammation, all of which perpetuate the vicious cycle of HF. Risk factors for CSA include male gender, higher NYHA functional class, lower ejection fraction, PCO2 < 38mmHg, presence of AF, higher BNP and frequent nocturnal ventricular arrhythmias. No screening tool has been validated to effectively identify CSA in patients with HF and as such, the need for further evaluation should be guided by the presence of these risk factors. Dental devices such as mandibular advancement splints may be considered as an alternative to CPAP/BPAP for those with OSA. CSA treatment aims to improve the underlying disease by optimizing HF medication therapy particularly beta blockers [#redeker-ns.-2008]. Nocturnal supplemental oxygen may be recommended for some individuals. Individuals should also be encouraged to adopt a lateral sleep position. [#szollosi-i-roebuck-t-thompson-b-et-al.-2006]. Adaptive servo ventilation is not recommended for patients with CSA. A recent trial of 1325 patients demonstrated increased all cause and CV mortality in patients with HFREF who were treated with this therapy [#cowie-mr-woehrle-h-wescheider-k-et-al]. Trials are currently being conducted to determine efficacy and safety of phrenic nerve stimulation for these patients. Useful patient resources are available at the Sleep Health Foundation website. Sleep-associated movement disorders include periodic limb movement disorder (PLMD) and restless legs syndrome (RLS). Sleep can be aided by following recommendations for insomnia. Severe disorders may require referral for pharmacological management. Patients with cardiac disease may experience insomnia for a range of reasons including medication related (e.g., beta blockers, oral corticosteroids, diuretics), depression or anxiety, and symptoms such as chronic pain or breathlessness. Treatment options for insomnia include short term sedative medication and cognitive behavioural therapy (CBT) and practising good sleep hygiene. Referral to a Psychologist may also be considered. While there are many sleep disturbance screening tools there is not one definitive questionnaire. Polysomnography (PSG) is the gold standard investigation for the diagnosis of sleep disordered breathing and uses the Apnoea Hypopnoea Index (AHI) to define severity of the sleep-related breathing disorder. In-home sleep studies also offer an alternative where PSG is inaccessible. Sleep logs and sleep questionnaires such as the Epworth Sleepiness Scale and the Pittsburgh Sleep Quality Index are also useful for assessing a patient's sleep situation. What time do you normally go to bed at night? What time do you normally wake up in the morning? Do you often have trouble falling asleep at night? About how many times do you wake up at night? If you do wake up during the night, do you usually have trouble falling back asleep? Does your bed partner say (or are you aware) that you frequently snore, gasp for air or stop breathing? Does your bed partner say (or are you aware) you kick or thrash about while asleep? Are you aware that you ever walk, eat, punch, kick, or scream during sleep? Are you sleepy or tired during much of the day? Do you usually take one or more naps during the day? Do you usually doze off without planning to during the day? How much sleep do you need to feel alert and function well? Are you currently taking any type of medication or other preparation to help you sleep? Do you have the urge to move your legs or do you feel uncomfortable sensations in your legs at rest or at night? Do you get up often to urinate during the night? How much physical activity or exercise do you get daily? Are you exposed to natural outdoor light most days? What medications do you take and at what time of day or night? Do you suffer from any uncomfortable side effects from your medications? How much caffeine (i.e., coffee, tea, and cola) and alcohol do you consume each day and night? Do you often feel sad or anxious? Have you suffered any personal losses recently? Arzt M, Bradley TD. Treatment of sleep apnea in heart failure. Am J Respir Crit Care Med 2006;173:1300–1308. Redeker NS. Sleep disturbance in people with heart failure: implications for self-care. J Cardiovasc Nurs 2008;23;231-238. Szollosi I, Roebuck T, Thompson B, et al. Lateral Sleeping Position Reduces Severity of Central Sleep Apnea / Cheyne-Stokes Respiration. Sleep 2006; 29:1045-1051. Suna JM, Mudge A, Stewart I, et al. The effect of a supervised exercise programme on sleep quality in recently discharged heart failure patients. Eur J Cardiovasc Nurs 2015;14:198-205. Bloom HG, Ahmed I, Alessi CA, et al. (2009). Evidence-based recommendations for the assessment and management of sleep disorders in older persons. J Am Geriatr Soc 2008; 57:761-89.